Fast forward 14 years later and I remembered that I had read somewhere the exact number of questions that Alma asked in this chapter. So I did a quick search and pulled up this amazing document by John W. Welch, who teaches at the J. Reuben Clark Law School at BYU. I remember enjoying his fantastic presentation at the Mormonism and the Temple Conference so I was immediately interested. 1. Among the Jews, every fiftieth year, being the year following the revolution of seven weeks of years, at which time all the slaves were liberated, and all lands which had been alienated during the whole period, reverted to their former owners. This was a time of great rejoicing. Hence, 2. A season of great public joy and festivity. Alma went to preach to members of the church, and anyone else who would listen, throughout the land (vs. 1-2). There seems to be a very deliberate form and structure to this sermon that paints a beautiful message that I don’t think I could ever do justice to. However, I’ll share some of my own insights and observations. We see the phrase “Have you sufficiently retained in remembrance…” 3 times in verse 6 alone. Alma draws the minds of the people back to the past and the fathers who were delivered, who the Lord was patient with, and who he delivered from hell. Remembering those that have gone before is the central theme to the first information presented. Alma is still in the past but this time he’s asking about the conditions that merited the deliverance and salvation of their ancestors. Now he brings things to the present. He asks, “Have you spiritually been born of God?” (vs. 14) and challenges his listeners to whether or not the atonement is actually in effect in their lives. Remember, he’s speaking to members of the church and asking them if they have been born of God or not. Alma returns us to the present where he explores another condition, “If you experienced a change of heart and have felt to sing the song of redeeming love, can you feel so now?”(vs. 26) Alma seems to be trying to wake up the “typical churchgoer” who really doesn’t know where they stand with God, whether they’ve just never made the connection or whether they have strayed from a state of holiness and now float in limbo. Perhaps many in the modern church are in that condition. If your best 2 years were 20 years ago in the mission field, have you really not improved since then? What happened? You remember being so close to the Lord, but time has passed, life became more complex and stressful, sin and temptation snuck in and your present state is a far cry from a former glory. How is your walk with God? Yeah, it’s time to reconnect. I’m going to go out on a limb here, and suggest that the fold of God is not necessarily the church you belong to at the present time. The sheep of the good shepherd may not be those in your congregation, but many might be. If you are looking for the fold of God, look no further than those who sealed their righteousness in their own blood and who’s stories fill the pages of scripture. Don’t compare yourself with Brother Busybody, ultimately look to Moses, Peter, Nephi, Alma, the Brother of Jared and especially Christ. Look to those that you know are sheep of the good shepherd. Alma tells us how he knows these things and gives some clues as to how you can too. partake of the fruit of the tree of life. Remembering those that have gone before is essential to our own salvation. They have written their own accounts, showing how they were delivered and reborn. If we take the Book of Mormon, we will discover that the many powerful conversions stories create a beautiful spectrum of ascent. There are so many kinds of people experiencing conversion and ascent. From wicked pagan kings, to lost sons of righteous men and even holy men of God, we see them all progress from one state to another. By identifying our own struggles with theirs, we can better see the clear path of ascent before us and by using their experiences as patterns, we too can enjoy the same blessings. Alma 5 holds many, many more secrets; do you have any to share? What principles in Alma 5 do you feel are the most powerful for you, personally? 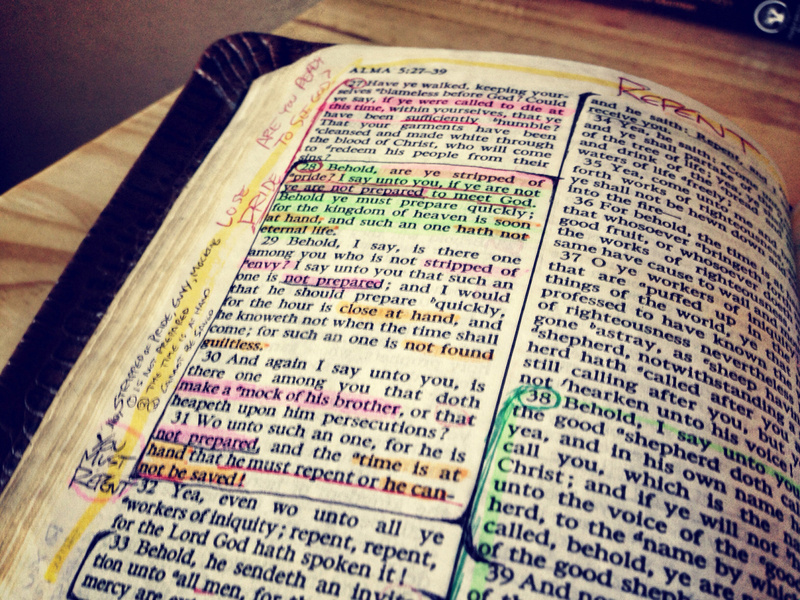 How else can we utilize Alma 5 in helping others find their way to (or back to) the Lord? Alma 5 is one of those chapters in the Book of Mormon, (and there are MANY), that prove that Joseph Smith was and is a prophet of God. I’m convinced that if all Joseph Smith gave us was Alma 5, that would be enough to prove his prophetic calling. The ancient structure of the text, the chiasmus present, the doctrine taught, the ascension theology, the symbolism used – Joseph Smith could not fabricate a word of it. Those inspired with the spirit of revelation and the spirit of prophesy will see many hidden things, including things which are to come in this one chapter alone. Those familiar with the temple will find familiar concepts, patterns, and pedagogy. And the chapter as a whole teaches the Gospel perfectly. I have a lot more to say about this and other chapters in our restoration scripture, but I want to give other people the opportunity to comment. God seems to always provide enough evidence to convince on one side or the other; perhaps he does this to respect agency. I don’t know that writing something amazing necessarily “proves” anything, though it certainly isn’t insignificant. While I think that you could probably make a pretty solid case by bringing to light all of the amazing intricacies of the Book of Mormon text as a whole, it’s what the understanding of that text does for you personally that is the most incredible thing of all. Precisely! At the end of the day, it doesn’t matter what we deem “amazing” from an historical or scientific perspective. A book can be 100% correct from a logical, mathematical, or scientific perspective, but if it invites individuals to live their lives in a manner that they are not willing to accept, they will find a way to prove it untrue. It’s the Spirit that must confess of the truthfulness, and in Latter-day revelation this means that it must feel right in our hearts and in our minds simultaneously. The understanding we gain from the Spirit then edifies us and testifies of truth. It’s funny, when I joined the Church and people were persuading me to reject the Book of Mormon as “nonsense” or “fiction,” I would simply tell them that perhaps they were right in their arguments. But the truth I felt about the book in my heart, mind, and soul was enough for me to know of it’s eternal significance and worth. Now, I obviously don’t believe the Book of Mormon to be “nonsense” or “fiction” – quite the contrary. But let’s just say this – if the same stories, layout, and doctrine occurred in another time on other planets, (which they did, do, and will forever more, but that’s a whole other discussion! ), and not in the “Americas,” would it make the book any less true? Now, I happen to believe that the authors of the Book of Mormon really did live in the Americas, exactly when they said they did, but that is irrelevant. The doctrine and principles taught in this book are eternal and true, and it is by the power of the Spirit that these truths become things known.